Cherries are associated with lower fat concentrations in the blood, which can help reduce overall fat mass and specifically weight around the abdominal region. Cherries also help to reduce inflammation which can help to fight off against heart disease and diabetes as well, which are two common diseases associated with being overweight and obese. 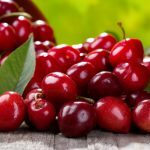 Why Are Cherries So Beneficial to Our Health? The main reason why it is believed that cherries are so good for our health is because they contain high concentrations on antioxidants, which help neutralize free radicals. This is important because free radicals are the root cause of many diseases, and antioxidants help protect our cells against these diseases. 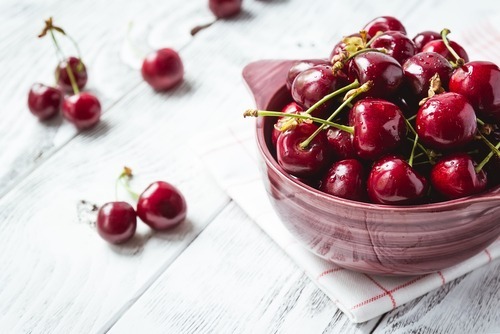 Other studies also have indicated that cherries may help remove excess body fat and increase melatonin which helps maintain regular sleep as well. Antioxidants not only help to fight off against disease, but may help to prevent disease as well. Studies have shown that specific antioxidants found in cherries, notably anthocyanins inhibit the growth of tumors. Cherries also have antioxidants that fight against damage done by free radicals to the eyes, which can cause blurry vision or complete vision loss. These free radicals can cause other degenerative problems with the eye as well, such as problems with the shape of the eye like fluid buildup in cases of glaucoma. Another benefit to cherries is that they improve the overall functioning of our circulatory system which can have weight loss benefits also. Cherries have compounds found within them that regulate certain genes that we have which are involved in the metabolism of fat and glucose. This can not only help to reduce the risk of heart attacks and cardiovascular disease by reducing the fat and sugar in our blood, but will also help us to lose weight in the process too. 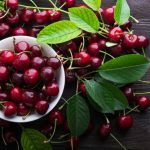 There are medications on the market that act in a similar fashion to the compounds found in cherries, however they come with severe side effects. Some of these medications can even cause heart attacks or death so obviously cherries are the better alternative if possible. Another benefit that cherries provide as far as the cardiovascular system is concerned, is that they are good sources of potassium as well. Potassium can help lower the presence of sodium in the blood which helps to lower blood pressure, reduces the risk of heart attacks, reduces muscle cramps and improves overall strength as well. When considering losing weight, getting enough sleep is very important. Sleep is not completely understood, however we do know that it is necessary in repairing the body and in performing optimally. Most people don’t think sleep has an effect on their weight but a lack of sleep can absolutely cause weight gain. This is linked back to sleeps role in reducing stress, and the stress hormone’s role in weight gain. When the body does not get enough sleep, it becomes stressed as a result and this stress affects other processes throughout the body. When the body is stressed, it produces a hormone called cortisol which encourages the accumulation of fat tissue. So, in essence not getting enough sleep can in fact cause you to gain weight, though not directly so it is no wonder that many people aren’t aware of this. Cherries help us to maintain our sleep schedules because it contains a compound known as melatonin, which is involved in the regulation of our sleep cycle. Eating cherries can help to raise melatonin levels, which can help us have more regular sleep and function better overall. Inflammation is a reaction from our bodies where white blood cells are released to prevent infection from spreading. Inflammation can be caused by many different things, which can lead to negative health effects. Inflammation can cause digestive issues that not only can lead to weight gain but can cause other more serious issues like cancers. Cherries ability to help fight against inflammation also helps to reduce muscle damage and pain during exercise. This can decrease the recovery time needed for exercise, letting you get back in the gym sooner than you normally would and making those gains.